There are times when we need and want a reliable continuous brace. For a brace to be continuous it needs to be a sculling brace. To get the details on sculling please see USK Article "Sculling". There are ways to make a brace more reliable and even more supportive. If we look at some basic physical principles you will see what I mean. The longer the paddle the more leverage you have for the brace and the more support you get. If you were to get a ten foot long paddle you would never capsize because of the leverage provided. However, you would find it very difficult or even impossible to paddle with such a long paddle if you could even lift it. As a quick review, it is important to keep the leading edge of the working blade angled toward the surface when you move it through the water. If the leading edge points down, the blade will dive and you will follow the blade down. I have found diving blades are a result of the paddler not changing the blade angle before moving the paddle in the opposite direction. 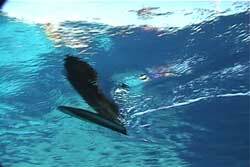 They attempt to change the blade angle while moving the paddle in the opposite direction. The change in the blade angle needs to occur before the paddle moves in the other direction. In fact I start the angle change at the end of the stroke. I do caution my students not to use the extended paddle position when side surfing, surfing or when getting hit by a wave. The potential force on the long lever, which can translate to your body, is not worth the risk. I do use the extended paddle sweep stroke when I need to do quick turns in the surf zone, but I am back in normal paddling position before any waves hit me (See USK article "Extended Paddle Forward Sweep Stroke"). Pictures seen above were taken from the USK Video "ABC'S of the Surf Zone" winner of best video of the year from Sea Kayaker Magazine Reader's Poll 2005.